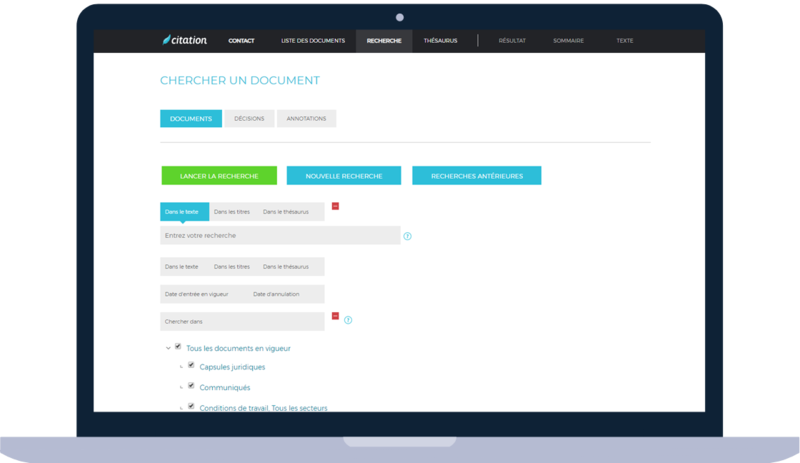 Supported by a powerful and easy-to-use search engine, Citation is the ultimate legal database for those working in the field of law or industrial relations. Citation works for you ! Available any time, Citation includes current and archived versions of complete labor law documents. You will find, among other things, public service collective agreements, policies, directives, and laws and regulations. The database also compiles case law from the varied body of labor law. Decisions are summarized and indexed to make searching, retrieval and consultation easy. Consult our legal articles on current labor law topics. Continually updated, you'll learn more about harassment, drug use in the workplace, the duty to accommodate, and more! Information at your fingertips ! Whether you work in law, labor relations, human resources management or occupational health and safety, Citation is the research tool you need! Would you like to see what the search tool can do before you subscribe? Test it 7 days for free.